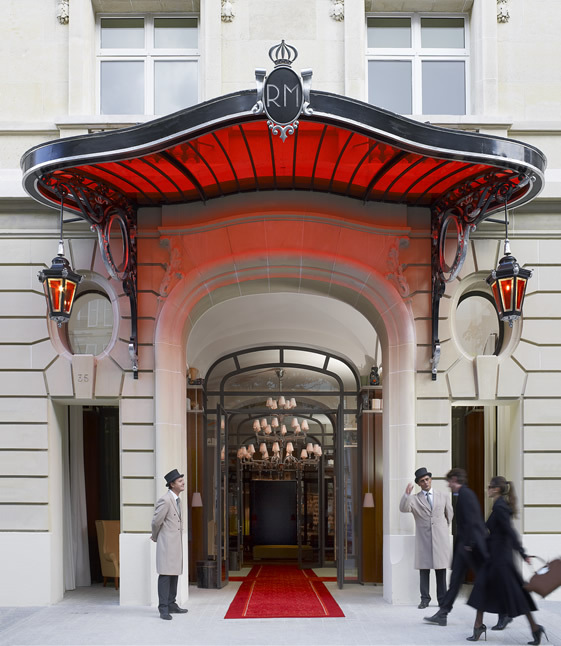 Having welcomed innumerable artists, dignitaries and celebrities since its doors opened in 1928, the historic Le Royal Monceau – a member of the Raffles group – has been shut for refurbishment (you may recall the über-extravagant demolition party) andsince recently – with interiors coming courtesy of the legendary French designer, Philippe Starck – those famous doors are again open. Celebrating all that is iconic about French opulence, whilst embracing Starck’s unique contemporary elegance, Le Royal Monceau is a truly breathtaking project. Arrive at the hotel and you’re in Le Grand Salon, which replaces the former stuffy lobby. This is now a large reception, snacking and lounge area. Facing you is La Cuisine restaurant, a contemporary space for 140 covers with a table d’hôte for 16 all the better to taste the cuisine of executive chef Laurent André and chef Gabriel Grapin. The “Picasso of pastry” Pierre Herme is taking charge of desserts. The second, Il Carpaccio, restaurant Italiano is directed by Tuscan chef Roberto Rispoli and his all-Italian team. The extravagant kitsch shell décor is by artist Thomas Boog, working with Starck. There’s a well-stocked library boutique where television screens beam live feeds from important art auctions and a blog of significant happenings .The hotel will host art exhibitions curated by celeb art-expert Hervé Mikaeloff and art concierge Domoina de Brantes is available to advise on purchasing art work from the hotel or visiting galleries and exhibitions. A first for a Paris hotel is the 100-seater cinéma serving ice-cream, gourmet bento-box snacks and popcorn by Pierre Hermé. Plenty of spaces are dedicated to les arts et les lettres, the main reason people come to Paris in the first place.